A collapsed road is seen following torrential rain caused by typhoon Lan in Kishiwada, Japan. TOKYO -- Toyota said it was operating second shifts as normal at its Japanese plants on Monday, after suspending first shifts as a typhoon precaution. Toyota temporarily suspended production at all of its assembly plants in Japan, including those of its subsidiaries as a precautionary measure as a powerful typhoon approached the Japanese mainland. Four people were reported killed, hundreds of plane flights cancelled, and train services disrupted in the wake of Typhoon Lan, which had maintained intense strength until virtually the time it made landfall west of Tokyo in the early hours of Monday. 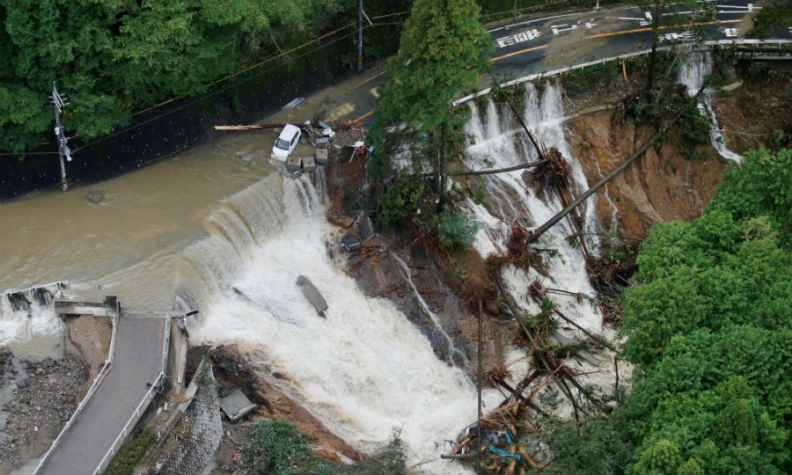 Some 80,000 people in Koriyama, a city 200 km (124 miles) north of Tokyo, were ordered to evacuate as a river neared the top of its banks, broadcaster NHK said, and several hundred houses in western Japan were flooded. Lan is the Marshall islands word for "storm." The center of the storm was out in the Pacific northeast of Tokyo on Monday afternoon and it was moving northeast at 75 kph (47 mph), the Japan Meteorological Agency said. It was expected to become a tropical depression on Tuesday.